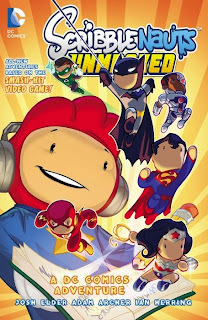 If you can't wait for Convergence, an unlikely appetizer to tide you over might be the digital-to-print collection Scribblenauts Unmasked: A DC Comics Adventure. Tonally the book is appropriate for kids, but at over 200 pages, this text-heavy book is no light read for grown-ups, either. Writer Josh Elder pens an epic and most of all far-reaching story that makes considerably use of the DC Comics landscape; even beyond the story value, simply poring over the bevy of characters drawn in Scribblenaut style on every page is a treat. The Scribblenauts Unmasked collection (called Scribblenauts Unmasked: A Crisis of Imagination in digital form) serves as a sequel to the game of the same name. I found this a refreshing change from custom, where media-tie in digital comics (Injustice, specifically, and also the recent Arrow and Flash comics) act as prequels to the game or show. I understand the reason, since for instance Arrow and Flash are still ongoing, though for something like Injustice I've felt a bit of frustration that I already know what's going to happen, so to speak, since the game is the endpoint. The Scribblenauts book continues the adventure, rather than leading into it; also, I imagine it's preferably for parents of young readers that interest in a video game sends a child to learn more in a book, instead of the other way around. The events of the video game, which are canon in the book, are referenced, but as someone less familiar with the game, I had no trouble catching up. More surprising is the considerable amount of DC Comics continuity that this book plays off of. The book borrows heavily, as the title suggests, from Crisis on Infinite Earths, with a smattering of elements from the New 52 Trinity War mixed in. The red skies, the shadow demons, and the Qwardian warriors should tip off any seasoned DC Comics fan that the story's central villain is the Anti-Monitor. Late in the book, Elder fashions for the reader a "The Game of Everything - Anti-Monitor Edition" board game that recounts and tries to make consistent the Anti-Monitor's history, from Crisis on Infinite Earths to his amorphous role in Sinestro Corps War and on to Blackest Night. What Geoff Johns has been doing with the Anti-Monitor in the past couple years has never been clear, and Elder builds off continuity to offer as good an endgame as any, at least until the forthcoming "Darkseid War." The book functions well as a tour of the DC Universe, especially for new readers. The story starts in Gotham City with Batman, his family, and his foes, then moves to Metropolis for the same with Superman. The Justice League is next, with mini-adventures for Aquaman, the Flash, Green Lantern, Wonder Woman, and Cyborg; then Scribblenauts Maxwell and Lily head to space for a full-fledged Green Lantern Corps team-up. It's then that things get really wild, as the story moves to the Phantom Zone, to Batman's brain, and into the Multiverse. Even the Limbo from Grant Morrison's Final Crisis makes an appearance, to the extent I'm hard-pressed to think of a DC locale that isn't at least name dropped (about my only disappointment is that Sandman and the Dreaming don't make an appearance, though former Vertigo characters John Constantine and Swamp Thing are certainly present). But, Elder can hardly be accused of leaving characters out. My shorthand list of unexpected character appearances while I read include Bat Cow, Superman Triangle Title favorites Bibbo (definitely) and Emil Hamilton (I think that's him), Blue Devil, Egg Fu, members of Batman, Inc., Ambush Bug, Starman Jack Knight's cosmic rod (at least), Space Cabby, Waverider, the Omega Men, Grant Morrison's Seven Soldiers, the classic Outsiders line-up, 'Mazing Man, what I think was the Inferior Five's Dumb Bunny, not to mention the Zoo Crew, characters from the New 52 Earth 2, the Tangent Comics Superman (! ), and DC One Million's Solaris, the Living Sun (pretty sure the Village People are in there, too). And I'm sure I'm missing some. As I said, one could spend hours trying to identify the characters in every crowd scene, not to mention regaling a child with the history of this and that character. Elder also peppers the book with characters spouting movie quotes, notably Superman II but also, for some reason, a bevy of Star Wars dialogue. My favorite was when Elder's Cyborg, in character somewhere between the DC Universe and Teen Titans Go!, finally shouts, "Booyah"; there's also a nod to the "goshdarn Batman." Neither did I overlook artist Adam Archer's tribute to Justice League International's "one punch." I would say that after the pitched battle on Qward between the Justice League and the Anti-Monitor's forces, Scribblenauts Unmasked did start to drag for me when it turned to the relationship between Maxwell and his ornery Scribblenaut doppelganger. This might be favoritism on my part of the DC Comics characters over the Scribblenaut characters, but again, there's a lot to this book, more than can likely be read in one or two sittings (the book picks up after that with Multiverse and Elseworld versions of the characters). There's also a long section showing off Lily's faux-Instagram photos, recounting some adventures through posted "comments," which I found more slow and annoying than cute. The book makes some points about how taking selfies helps Lily's self-esteem that I found dubious; I tend to think most parents wouldn't want to encourage Scribblenauts-age kids to take selfies, letting alone whether rampant selfie-taking helps or hurts self-esteem. Overall, however, Scribblenauts Unmasked: A DC Comics Adventure is a delight -- long, detailed, saccharinely-sweet but not too juvenile necessarily, and certainly steeped in DC Comics lore. If you can't wait for DC's next big Crisis, there's a good one here waiting for you already.